The Jack Hogg Memorial Shield could provide a pub quiz question in the future. The poser: How did two new managers both win a trophy on the night they took charge of the new teams for the first time without even winning a game? The answer: A deadlock involving the Whittlesey Athletic side of Liam Harrold and Dave Panton’s Moulton Harrox outfit in the traditional curtain-raiser to the local season last night (August 7). With no extra-time or penalties played in this fixture, it means the shield is shared and will spend six months in the care of Athletic before being handed over to Harrox. It was an outcome which appeared to leave both new bosses content although Harrox were certainly more deserving of victory than the PFA Senior Cup holders. 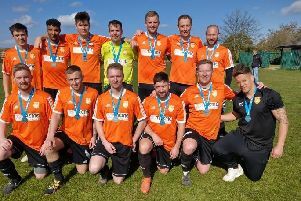 The Lincolnshire lads were only involved due to finishing third in the Peterborough & District League Premier Division last term. Champions Oakham United have since moved up into the non-league ranks while Whittlesey were runners-up. But they were the better side for the majority of a contest in which they were left to rue a missed penalty and the continued excellence of Whittlesey goalkeeper Lewis Moat. Skipper Billy King was the man to mis-fire from the spot when dragging his penalty wide in the 20th minute. Harrox did soon hit the front courtesy of a goal of sheer simplicity. Joe Townsend’s right-wing cross could not have been any more pinpoint and Ian Bradbury’s header could hardly have been better placed. But that would be the only time the Whittlesey net bulged thanks to the brilliance of their goalkeeper Moat who fought a running battle with Harrox dangerman Ben Allen. Three times he denied the tricky winger in the space of seven minutes late in the first half before denying Allen, King and Bradbury in the early stages of the second period. Allen was surprisingly replaced just after the hour and Harrox were considerably less dangerous after his exit. They still looked comfortable though until Whittlesey equalised out of nothing with a goal of high individual quality. Just as he had done in the PFA Senior Cup at the end of last season, midfield enforcer Adam Piergianni found the net from long range. His curling 25-yard effort with 15 minutes remaining restored parity and ensured honours ended even. Whittlesey Athletic: Lewis Moat, Harry Jenkins, Jake Pell, Luke Bonney, Rikki Wilmer, Kev Gilbert, Joe Butterworth, Adam Piergianni, Jack Smith, Matt Heron , Jack Bates. Subs: Dan Drane, Ash Moore, Liam Harrold. Moulton Harrox: Lee Keneally, Phil Groves, Ainsley Johnson, Bobby Patterson, Ash Coddington, Billy King, Joe Townsend, Jake Cawthorne, Ian Bradbury, Ryan Wheeler, Ben Allen. Subs: Louis Steadman, John Ball, Matt Cardell, Jordan Bailey-Smith.